« Don’t Believe Me Just Watch! 33°45′18″N 84°23′24″WThe Equinox is the symbol of balance. Equality of light and dark, day and night. As winter approaches the days will get shorter as the nights get longer and longer. Call me strange (I don't mind – and agree with you!) but I think a lot about how the planet was "designed" and how that design influences us. I moved from Atlanta, located at 33°45′18″N 84°23′24″W to Aspen, whose coordinates are 39°10′54″N 106°50′26″W. So I'm now living somewhere that's 6 degrees higher in latitude than Atlanta. Doesn't seem like much. But when I first moved here, the days were over two hours longer in the summer. Which means that the reverse will be true in the winter. Longer nights, which would make it colder to begin with, but when you add the influence of the curvature of the Earth to make it six degrees of separation (sorry I couldn't resist) it makes a pretty signficant difference in temperature. My hometown, Lexington, Kentucky is 5 degrees higher in latitude than Atlanta, and it was usually about 10 degrees cooler year-round. Of course, in Aspen you have to account for the 7000 feet rise in elevation. So it's coooolder here – for a lot of reasons. But, thankfully, there are two other factors that help. First, the weather is "drier," which makes the cold not affect you as much. And secondly, we're closer to the sun, so the sun's rays are warmer. 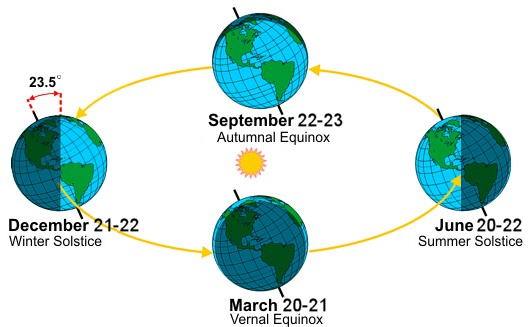 If the Earth didn't have a tilted axis, then there would be no summer or winter seasonal shift. The length of days would be the same all year long. The scary thing is that the axis is changing – and we're the ones changing it.